I picked up this Once A Week Bio-Deodorant at Watsons recently. 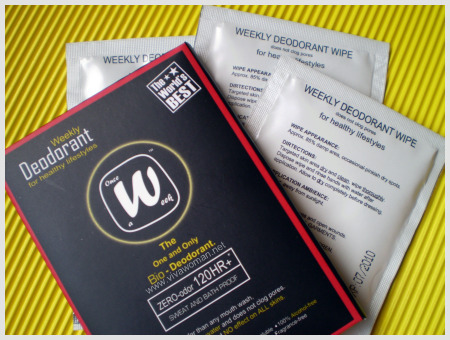 At S$3.90, the packet comes with three wipes that you can use to neutralize body odor. It is water-based, fragrance-free, stain-free, colorless,Â non-sticky and 100% alcohol-free.Â I only have to use one wipe per application and it is supposed to provide me with a week long protection. So how effective is this for me? Honestly, I wasn’t expecting much from this weekly deodorant. I have tried PerspireX a few years ago where one application was supposed to leave one odor-free for 3 to 5 days but it didn’t cut it for me. But anyhow, I still bought the Once A Week Deodorant because of the novelty and the price point. And boy was I surprised. Okay, it didn’t quite last me a week but about 4 to 5 days. Still, it lasted long enough to impress me because I thought that was quite a feat for my level really considering *ahem* my state of odor. Plus I like the fact that there was no mess. I just had to make sure my underarms were clean and dry and all I had to do was to rub the wipe on the areas. When I was using PerspireX, I had to use a hairdryer to air my armpits dry. Yeah, it was funny but that was what I had to do. With this weekly deodorant, I didn’t have to do anything more and it dried up very quickly. In fact, I forgot that I was wearing it throughout the first day because I felt so clean and fresh the entire time! The drawback for me is that this isn’t entirely sweat proof as claimed. By the second day, I could smell that this deodorant wasn’t making it when I perspired while going about on my household chores. But, after taking a bath, the smell was gone and I could go about my usual without having to wear another deodorant for the day. So my conclusion is that this Once A Weeky Bio-Deodorant is good for everyday use if you do not perspire a lot. I doubt this would cut it for a week if you’re wearing it to exercise or spending time under the hot sun.Â Â My guess is that under such circumstances, this deodorantÂ may leave you odor-free two days or so at most. The wipes contain more than 85% water as well as propylene glycol. lactic acid, glycerol, potassium sulfite and lactobacillus ferment. Not natural ingredients there and propylene glycol has been said to be a skin irritant so I am not sure if these wipes are safe for all skin types. However, it caused no irritation for me whatsoever and left no stains on my clothes too. Well, if you’re looking for some novelty, try this for fun. If you’re someone who does not perspire a lot but need some cover up, then this may well work up to a week for you. However, I think this is rather expensive when used long term. If it works weekly, you’ll have to spend S$62.40 for a year’s supply. So unless your current deodorant is costing more and not working well, this Once A Week Bio-Deodorant may well be good only when you go on a short trip or vacation because of the convenience. The product by the way is produced in US but marketed from Malaysia according to information from this website. I m currently using Sukin deodorant. I like it very much because it has a nice smell that’s not too over-powering. I’m quite put off by those brands that’s strong in smell. I only need to reapply once a week maybe because I don’t perspire easily. I think smelling nice also helps to lift our mood. I haven’t seem this wipe in Watsons but I guess would come in handy when travelling. Peapot: Wow, you’re so lucky! You only need to apply deodorant once a week. I can’t. I have to apply everyday! I don’t like Sukin’s. I have it. It works in terms of the smell but it drips cos of the liquid spray and I find it messy. marketed frm msia? why havent i seen it before? i am not a deodorant person as it leaves something waxy on armpit and tht irritates me alot. I used deodorant when I was a sweaty teenager running around. But then I stopped using it when I realised that deodorant clog pores at the armpit. pf: I wish I don’t need to use deodorant. But really, no choice. I can’t even go without it when I’m indoors all day so you can imagine. *SIGH* You all are so lucky! Raelynn: Oh dear…I wonder what happened? I’ll send a note to Jess and see if she’ll response. She’s usually prompt but the last time I sent her a note, I didn’t get a reply…but I just thought the note was also something that did not need a reply so I didn’t think much of it. Update: Hey Raelynn: Jess replied me and said she has been replying to emails and also checking her spam folders in case the emails get there. Do you mind if I give her your email address (which you leave in this comment) cos that way, she can write to you and follow up with you on your enquiry. Please let me know as I don’t want to take the liberty to give her cos of privacy issues. Hmm – those of you that don’t have to use deodorant are very lucky! Thanks for the review on this – I think I’ll pass and stick to my usual brand. Kimberly: You’re welcome! I’ll be sticking to my usual too but may buy this on and off for occasional usage cos of the convenience. Elleve: Hey, that’s great! I’m glad it worked for you. I’m out of it now and haven’t bought another one as my usual cost less and is drier too. Is this wipe natural and safe? I am trying new deodorants and I’m curious whether this deodorant has potential health impact. Jasmine: I can’t be sure about the health aspect but as I wrote, the ingredients are not natural. One of it is a known skin irritant and if I’m not wrong, has some health issues too…although this wipe contains 85% water. So it really depends on your threshold. Yeah. I bought both Kose black mask off proper shops. The full sized tube I got is from Changi airport. They shouldn’t be fake. Maybe I left it on for too long?Previously I left it on for 20 mins but there were bits that weren’t dry when I took the mask off. So, when I use the full sized tube, I left it on for a bit longer and make sure everything is dry before peel off. My face has been itchy for 3 days. Thankfully, I’m on medication for a cold. So it kinda helps the itch as well. pf: If you didn’t leave it on for too long, then it shouldn’t be a problem. I remember leaving this on for 30 – 40 mins sometimes when I was using it. But itching for 3 days? If you do try again and it gives you the same problem, then it’s probably not right for your skin. Or maybe on some days, our skin becomes slightly sensitive. Let’s hope it’s more of that. *sigh* I will try again. pf: Wa, like that better not use anymore. But ultimately, you just need to take care of your hygiene – shower twice a day (morning & evening), use a 24hour deodorant & splash your fave perfume. That’s what I do everyday!! Sigh this looks tempting. Ive been wondering if I should try this. I am using nature’s gate now but sometimes I feel like I need to reapply it again. I bath in the mornings and evenings and keep myself clean yet when I sweat I really stink. SIGH. My experience with natural deodorants like Nature’s Gate is that it doesn’t work very well if the weather is hot and humid. I am now just applying baking powder mixed in with a little water with a cotton pad each day. Control is fairly good. Used to add a little essential oil but figured out I need to moderate usage of those. Personal experience, it does work btn 5-7 days, even with the vigorous sports training I have daily. But it is not entirely true that it doesn’t stain. If you were to wipe it with your white clothes on, you will see brown stain. Apart from what it claims, I am a little concern of it really is. That’s why I google & bump into this site but yet to find the real research base review. 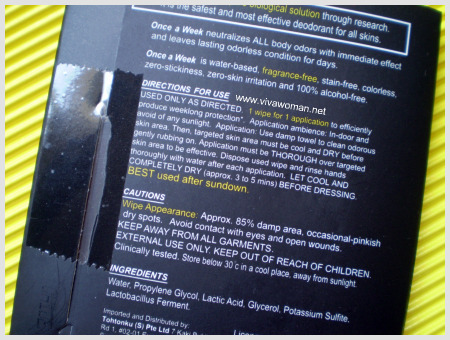 A friend and I were traveling South America last year, and she had brought a deodorant called Lavilin on the trip. I tried it while we were traveling and have never switched back since (one of the first things I did when I got back was to buy some for myself). Itâ€™s really cool if youâ€™re constantly on the go like me, since you only need to apply it once a week and you’re set. 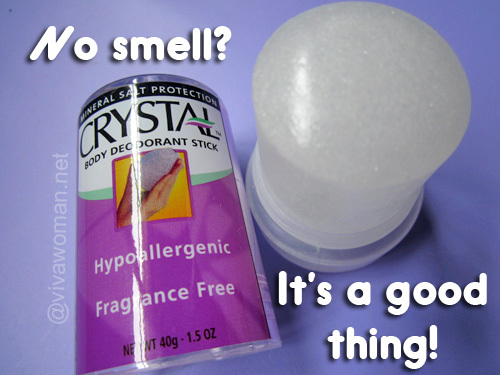 If you’re going away for a weekend, or even a week, no need to pack any deodorant! I haven’t seen it around…probably not available here. Do you know where you can buy these deodorant wipes? I got it from Watsons in Singapore. HI Seasame. 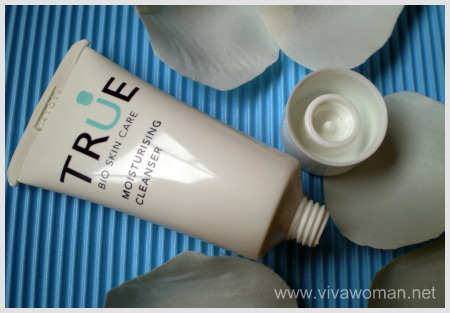 despite dubious ingredients, I had recently tried this wipes & I’ve to say altho I sweat a lot I just had to apply once inthe weekend & again at about the middle of the week & there isn’t a need to apply deodorant anymore for the rest of the week! If only they can come up with a stronger version… still, it’s very convenient & effective will keep using this. at least this is better than the klorane one which made me stink!